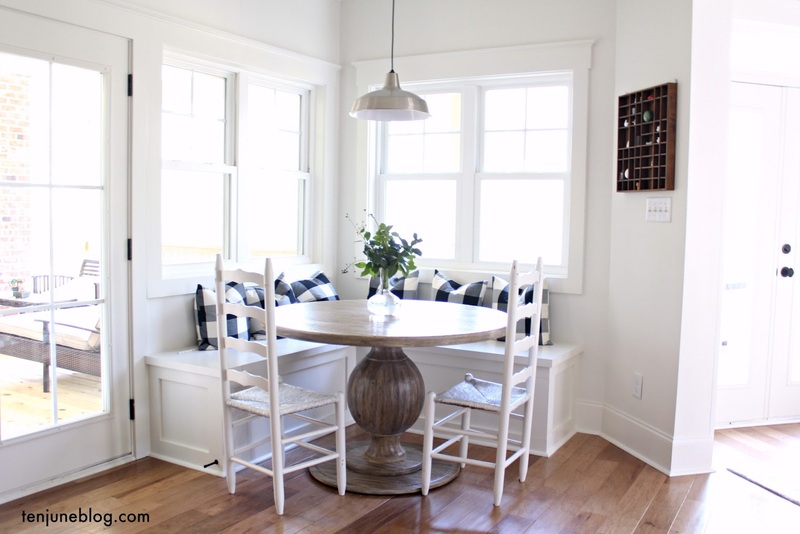 I kind of love when function and pretty things get together for the perfect combination, don't you? I've been majorly obsessing over the "dipped" painting technique for awhile. And I had a boring looking step stool that I wanted to pretty-fi... ta-da! A match made in heaven. A few weeks ago, I picked up this IKEA Bekvam step stool. We really needed a step stool around the house, since we've got a few high storage spots around our rental house that this shorty has a problem reaching. And I'm sure that the older HDawg gets, the more step-stooling he'll want to do. At $14.99 and solid wood, this IKEA piece was too hard to pass up. I simply taped off the legs (I measured up about four inches from the ground) and then covered the rest of the stool with a trash bag. Fancy. That's how I roll. Then I went into my jungle of a yard (David has cut it since this photo was taken, I promise) and spray painted my little heart out with some Rustoleum Glossy White spray paint. I just love when simple and sweet projects come out well, don't you? 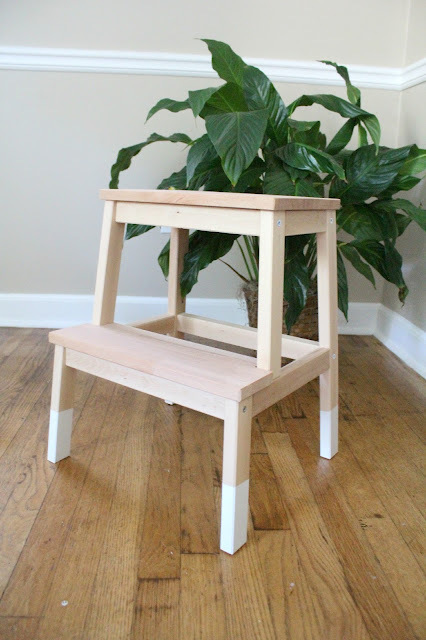 Now that it's all jazzed up, this step stool will be a fun addition to any room in our house. 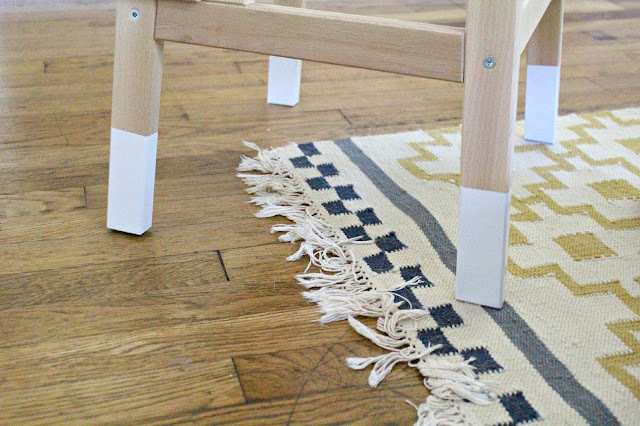 I wanted a subtle white color, but how cute would a bold red or yellow be on the step stool's little feet? What's even more fun is this Bekvam hack my girl FC did over at her blog, Freckles Chick. 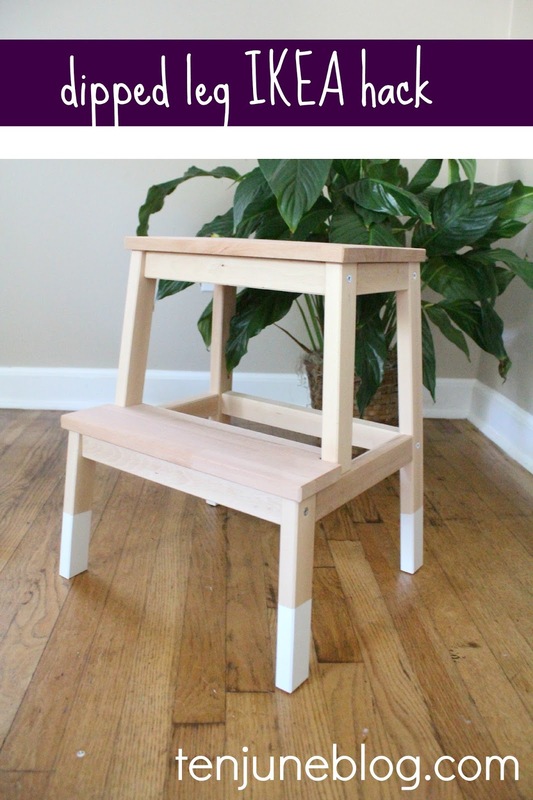 She posted her painted version of the step stool last week. Don't you love it?! I emailed her last week and told her we were working on the same project... girl loves herself some IKEA hacks and red wine like me, so we're more or less kindred spirits : ) Great minds think alike! Anyways, check out her version, it's rad! I'm always a dipped legs fan! Love this (and Freckles' version, too). We have the same stool at our house. My son uses it for its intended purpose, but also as a little picnic table. Now I want to break out the paint! I;ve been dying to dip some legs, I love the Little Nest furniture and want to DIY my own version. I actually have an idea for the new nursery, just need to find the right piece!! Love dipped legs! Looks good Michelle!